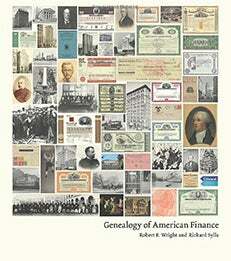 In Genealogy of American Finance, Professor Richard Sylla and his co-author, Robert E. Wright of Augustana College, outline the history of the 50 largest banks in the United States. The authors look at the evolution of the American banking system over more than two centuries of country-wide change, including war, economic crises and financial opportunities. They consider how the 50 largest financial firms achieved positions of dominance, and the impact each bank has had on the United States’ political, social and economic growth. The book also features illustrated “family trees” of these 50 banks. Richard Sylla is the Henry Kaufman Professor of the History of Financial Institutions and Markets and a Professor of Economics.